Aftermath of Hurricane Sandy in Atlantic City, NJ. Photo from UCC.org website. The United Church of Christ has announced two volunteer opportunities for those interested in helping rebuild homes damaged by Hurricane Sandy. Help is needed in Atlantic City, NJ, in partnership with the Fuller Center for Housing. This community is ready to embark on the repair/rebuild stage of disaster recovery. The minimum age is 16 years (with some limited projects for volunteers age 14 and up). For more information, click here. Opportunities for service (and group housing) also are available in New York City in partnership with New York Cares, with housing at a local UCC church. This opportunity engages volunteers in the continuing muck out/mold remediation stage of disaster recovery. Volunteers at this location will not be doing repair/rebuild. Although disaster-related projects are assigned with priority, groups serving here also may engage in non-disaster-related volunteer projects with New York Cares. Those particular project assignments are made one month prior to the date of service. The minimum age for this location is 18 years. For more information and to register, click here. 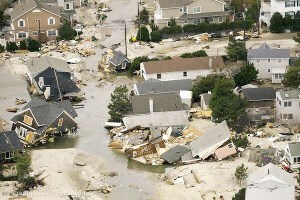 The length of time between destruction caused by Hurricane Sandy in late October of 2012 and today, when impacted communities still are hovering between the continuing clean-up stage of recovery and the housing repair/rebuild stage illustrates the need for the commitment to long-term disaster recovery. The recovery process takes a long time. The sustenance of faith feeds a commitment to accompany people through the long-term process of disaster recovery.